Not every soldier has the skills to mentor and advise foreign forces. The recently released Foreign Policy White Paper echoes the requirement in last year’s Defence White Paper for greater security cooperation with nations in the Indo-Pacific. Together, these two documents make it clear that international engagement by the Australian Defence Force (ADF) in the region is growing in importance. As such, the method in which the ADF conducts international engagement needs to be formalised in order to maximise the effectiveness of the Defence Cooperation Program. It is time for Defence to cultivate international engagement specialists within what could be described as a deployable ‘Joint International Development Group’. The government delivers national security through the Strategy Framework. This framework seeks to provide clear links between the government’s strategic priorities through the establishment of a ‘strategy-led capability planning process’. It uses the classic strategic construct of ends (those things that need to be achieved), ways (the manner in which they will be achieved), and means (those resources required to prosecute the strategy). The strategic end state of both Defence and Foreign Policy White Papers in the Pacific is explicitly stated as maintaining Australia’s position as ‘the principle security partner for Papua New Guinea, Timor-Leste and Pacific island countries’. The way Australia will achieve this is primarily through the Defence Cooperation Program (DCP), which includes the Pacific Maritime Security Program (PMSP). Together, this allows Defence to fulfil its part in supporting the foreign policy aim of better coordinating ‘defence, police, intelligence, border and law and justice training’ in the Pacific. The strategic direction is clear. The question that remains is what resources, or means, will Defence allocate to this task? Historically, the DCP has concentrated on embedding a number of officers, warrant officers and senior non-commissioned officers as advisors in key positions within host nation militaries. Australia has also been critical in providing equipment and sustainment support. This has been augmented, as required, by short-term training teams taken from existing units in mainland Australia. While this has had some success, the ad hoc nature of these teams is less than ideal. At a minimum, an advisor needs to understand the local language, the local culture and values, the local military institutional ethos and how it works, his counterpart as a person in that foreign culture and constrained by that military institution, the local capabilities and limitations, and the specific local situation to comprehend what is going on around him and to preclude misunderstandings. Then it may be possible to offer advice suitable to the situation. Two of Australia’s closest allies have recognised that to conduct these advisory roles requires specialist skill sets and training, and this year have set up specialist units dedicated to this military task. The US Army has established six Security Force Assistance Brigades who will undergo training at the Military Advisor Training Academy so that they are prepared to ‘train, advise and assist’ overseas partners. Likewise, the British Army has established a Specialised Infantry Group that will comprise of units geographically focused on specific areas of the globe with teams permanently deployed to ‘train, advise, assist and accompany’ local forces. The idea is that with individual battalions assigned to regions they will start to build a collective knowledge of the people and culture they will work among. The ADF is a much smaller organisation, so it will be unable to devote the large numbers of personnel to the task that its US and British allies have. However, the ADF has the benefit of strategic guidance that is more clearly defined. Therefore, the focus for permanent international engagement for Defence should be the Indo-Pacific, in support of both the Defence White Paper’s second strategic defence objective and the Foreign Policy White Paper’s emphasis on the region. The ADF needs to develop international engagement specialists, contained within a Joint International Development Group, that are trained to support embedded members of the DCP and the roll out of the PMSP. The organisation needs to be comprised of experienced officers and senior personnel from all three services who, like their British and US counterparts, are able to train, advise, assist and accompany local forces from countries in the Indo-Pacific region. The breadth of this task is important as it will give the group flexibility. 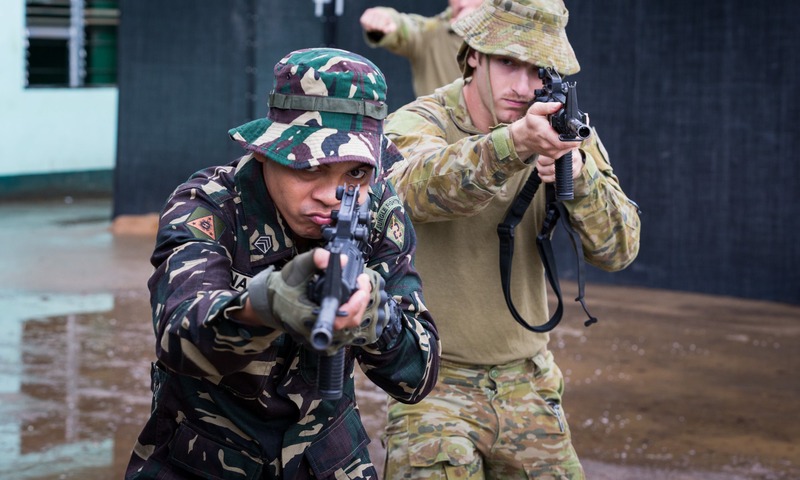 For example, consider a team deployed from the group to deliver urban operations training to the armed forces of the Philippines. This team may be restricted to training and advisory missions on military bases for political and force security issues. But a Navy team from the group sent to a Pacific island nation may accompany crews out to sea while assisting in the introduction to service of a patrol boat under the PMSP. Equally important is the ability for the group to be able to maintain an internal rotation cycle so that the engagement can persist while also allowing for training (including in regional languages) and periods of leave to be undertaken while not deployed. Thus, a minimum of two identical teams per capability – for example two infantry training teams and two patrol boat teams – should allow for three month deployments to be balanced with training and leave requirements. The key is to allow for persistent engagement in the region without burning out the personnel or their families. For ten years, the Australian Army Training Team Vietnam hand selected instructors, gave them mission specific training, and placed them where they could best improve the Army of the Republic of South Vietnam. The team reached a peak strength of only 217 members, yet had an effect far exceeding its limited numbers. A Joint International Development Group could have a similar effect throughout the Indo-Pacific and would provide a dedicated ‘means’ to deliver a key strategic end state for Australia. Business is shy of investing in the Pacific without a framework to resolve cross-border commercial disputes. In selecting Greg Moriarty for the job, Payne, Pyne and Turnbull leapfrogged over the obvious candidates – in doing so they have chosen well.